I was surprised to learn this weekend how many of my family members had not played Angry Birds. If you have not, you are not missing much save an addicting, seemingly endless puzzle game that has grown in popularity like bamboo grows in China. 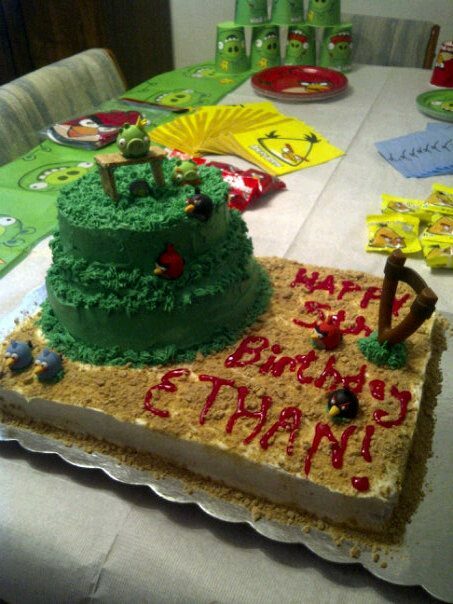 Ethan’s birthday party theme was Angry Birds. It was originally a carnival theme, but finding invitations, party favors, games, and other odds and ends proved too much for my sister – who waited too long to organize – and she was forced to reconsider. Choosing Angry Birds was an easy choice, however, as Ethan has played the game and owns many t-shirts depicting our favorite, screaming birds. The gathering itself was small, graced by the usual family members and Janessa and her kids. The bounce house that was originally scheduled for the carnival theme fit right into the new one and was used wholeheartedly by the young people. 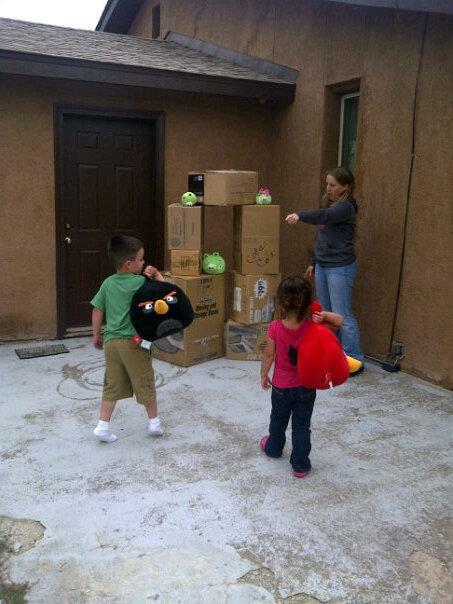 Our life-sized Angry Birds game was a big hit too. We stacked cardboard boxes, placed three pigs throughout, and had the children hurl Angry Birds stuffed animals at the towers. The cake was beautifully done – by my mom, sister, and I the night before – and also a great addition to the birthday festivities. Here’s me telling the kids they’re getting too close before they throw. Cheaters. Now THAT is an Angry Birds cake. This week is going to be a typical one of chores, check-the-block, and getting ready to travel. Matt’s passport came in the mail the other day and now we must take care of getting his name changed on his drivers license in California. Most of the name change chores are either done or somewhere close to it. The taekwondo school was trying to accommodate our upcoming travels by scheduling the next belt test after we returned to Albuquerque, but it was difficult to get enough black belts together to observe all the testers. So the school is going to test Matt and me tomorrow and schedule the main test while we are in California. I love how the school has gone out of their way to be flexible with us in almost all things. The end of September will find Matt and me competing in a tournament in El Paso, Texas. We went to a tournament in Las Cruces, New Mexico a few weeks ago to allow Matt to see how they work and what is generally expected of competitors. Having never been involved with martial arts of any kind, there is a lot hidden behind a screen in his eyes. Gradually, we are removing the curtains and helping him adjust to being a martial artist. I think I will compete in forms and sparring. Matt is unsure if he will do both as well, or if he will keep just to the forms. Sparring is still new and somewhat scary, so jumping right in – like I prefer to do – is not something he wants to do. I hope he will do both because the practice is beneficial and the experience makes for great lessons. Win or lose, there is an opportunity to learn something. I got a call from Full Sail the other day. They conduct periodic checks of graduates to see how they are doing, if and where they are working, and if there is any help the school can offer in furthering the success of the former students. It is not hard to believe that I am a little frustrated with how my post-graduation life has gone. No, I said that wrong. There has been so much good in my life since graduation. What would be more accurate is saying I am frustrated with my professional life post-graduation. I was straightforward with the caller with all my complaints and lack of success in finding someone to hire me. I was also forthcoming with my motivation to go back into the Army and the waiting period in which I currently find myself. They asked the usual questions. I did not really give her the chance to ask if I had conducted my interviews professionally, as I had never made it to the interview portion of the application process with any job to which I had applied. I talked a little bit about my board a couple of weeks ago, and how well it went for me. I do not know if the conversation with Full Sail changed my resolve or focus any. It did make me a little sad, but more at my own shortcomings than their lack of support or help in finding a job after I graduated. It was supposed to be easy, you know. I was a soldier, I had a near-perfect score in almost every class, perfect attendance, and many awards. None of those things got me hired, did they? Maybe I should have slacked off a little. Ugh, I can make that joke all I want, but I do not really know how to slack off. I have placed all of my hope in October. I cannot help but pray for success in that endeavor so that I no longer need to lament what could have been, or what should have been. The first week cannot come soon enough, and yet it hurtles at me at the speed of a comet. It is terrifying having so much riding on one decision. I have not really talked game stuff in a while. Diablo 3 is much the same as it was, and I am still just as awesome. The next expansion of World of Warcraft is coming later this month, and I still do not know how I feel about it. When explaining it to John the other day, it feels much like breaking up with a boyfriend and not wanting to go somewhere because you know he will be there…, but so will your closest friends. “It’s just a game,” everyone says. That might be true, but without that game, I would not have met John – my twin who is eight years younger than me – or my husband. I have friends spanning the four, farthest reaching corners of the US and multiple countries beyond them. It might just be a game, but these people behind the avatars are some of my most stalwart supporters and truest friends. No, I do not know what I will do about WoW. I reached 1000 words much sooner than I thought I would tonight. Shutting it off, but looking forward to next week! I love the Angry Birds theme. That cake looks awesome! Hang in there on the job search. I really hate to hear someone trying so hard and falling short. I ran into the same thing after college and ended up settling for something other than my major. I spent a lot of time looking though, and it was frustrating. It always seemed to be more of who you know or what you’ve already done somewhere else than what you can do and what you have to offer. Sometimes veering off the chosen path a little can pay off. Good luck…it’ll happen.